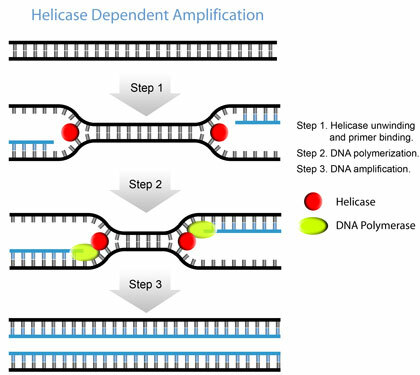 Perform isothermal amplification using a novel technology developed and produced by BioHelix Corp., a former NEB-affiliated company, now part of Quidel Corporation. Thermophilic Helicase-Dependent Amplification (tHDA) is a novel method for isothermal amplification of nucleic acids. Like PCR, the tHDA reaction selectively amplifies a target sequence defined by two primers. However, unlike PCR, tHDA uses an enzyme called a helicase to separate DNA, rather than heat. This allows DNA amplification without the need for thermocycling. The tHDA reaction can also be coupled with reverse transcription for RNA analysis. IsoAmp® II Universal tHDA kit can be used to amplify and detect short DNA sequences (70 bp - 120 bp) at a constant temperature. The kit can be used with a variety of templates, including microbial genomic DNA, viral DNA, plasmid DNA, and cDNA. A single copy of target DNA can be amplified by tHDA and detected by agarose gel electrophoresis when optimized primers and buffer are used. IsoAmp® II Universal tHDA kit is based on a second-generation thermophilic Helicase-Dependent Amplification platform. The reactions supported by IsoAmp® II Universal tHDA kit include tHDA, reverse transcription HDA (RT-HDA), real-time quantitative HDA (qHDA) and real-time quantitative RT-HDA (qRT-HDA), from a single reaction buffer. IsoAmp® II Universal tHDA kit contains an enzyme mix, dNTP solution and buffer, allowing flexibility in reaction setup. A Control Template and a set of specific primers are supplied for the positive control reaction. Recommended storage conditions for the tHDA kit are -20°C for storage shorter than 6 months and -80°C for storage greater than 6 months. Please avoid repeated freeze-thaw cycles as this may decrease performance of the kit. Positive control assays with varying amount of Control Template. A, two-step tHDA positive control with 10 pg - 1 ng Control Template. B, two-step qHDA positive control using 500 fg - 5 ng, in triplicate. How to design the primer and select the amplicon for IsoAmp II Universal tHDA Kit? This product is covered by pending U.S. and foreign patents. The purchase price of this product includes a limited, non-transferable license for research use only under the patents owned by Quidel Corporation. No other license under these patents is conveyed expressly or by implication to the purchaser by the purchase of the product. The Product is not to be used for diagnostic purposes nor is it intended for human use. This product may not be resold, modified for resale, or used to manufacture commercial products without written approval of Quidel Corporation.